Sisanda Henna, is a well-known television personality whose message reaches to all kinds of audiences from the rural village communities to blue-chip and JSE-listed companies. Facilitating important and may be difficult internal corporate conversations, be they about change management or conflict resolution, Henna will help you to connect with each other. He helps to cultivate connective leadership from Boards, Executives, to staff. 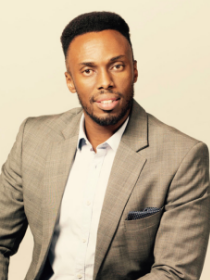 Sisanda will share his experience with you on how he overcame setbacks, without a degree or connections, and successfully broke into film and television. As an entrepreneur who has walked the journey, Sisanda will show you how you can create possibility for your own life. Sisanda has over 15 years of experience in the film industry. He honed his stage presence and sensitivity to audiences in his work as a TV presenter, in performing arts in industrial theatre, and as an actor. He has played both lead and supportive roles, featuring in popular sitcoms, drama, and feature films both locally and abroad. He has won awards of recognition in the film industry, including Best Actor Award and Eastern Cape Metropolitan Young Achiever Award, early in his acting career. Sisanda has hosted events for major corporate groups during their product launches, celebrations, and customer training. Sisanda has a rare ability to connect with both leaders and ordinary employees, bring enthusiasm to corporate events, and facilitate large groups through difficult internal conversations. He is an accomplished and warm presenter, facilitator, and MC, and always sensitive to both the needs of the client and audiences. Currently, Sisanda is currently working on multiple International Film project, and is passionate about empowering a new generation of leaders.